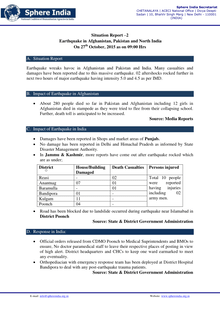 Earthquake wreaks havoc in Afghanistan and Pakistan and India. Many casualties and damages have been reported due to this massive earthquake. 02 aftershocks rocked further in next two hours of major earthquake having intensity 5.0 and 4.5 as per IMD. 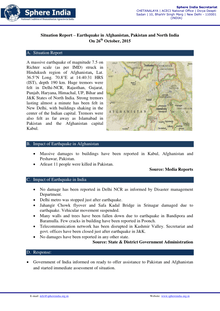 A massive earthquake of magnitude 7.5 on Richter scale (as per IMD) struck in Hindukush region of Afghanistan, Lat. 36.5°N Long. 70.8°E at 14:40:31 HRS (IST), depth 190 km. Huge tremors were felt in Delhi-NCR, Rajasthan, Gujarat, Punjab, Haryana, Himachal, UP, Bihar and J&K States of North India. Strong tremors lasting almost a minute has been felt in New Delhi, with buildings shaking in the center of the Indian capital. Tremors were also felt as far away as Islamabad in Pakistan and the Afghanistan capital Kabul.